A few weeks ago, Mayor Jean Quan sat down with members of Baseball Oakland and A’s Fan Radio to answer some questions about the city we love and the future of its sports teams. We thank the Mayor for giving us her time. Below is Part One of a two-part interview with Mayor Quan. We hope you like it. Question: A truly diverse city has many fabrics: the business community, music, the arts, sports. Oakland is blessed to have all of that and more. How does sports fit into the fabric of Oakland and why is it important for the city? Mayor Quan: Well, Oakland has been the home to a lot of sports greats. Bill Russell was here just the other day, with the Warriors, for example. The sports tradition in Oakland has been amazing. So you have greats like Rickey Henderson and Bill Russell — God, there’s so many of them. Curt Flood did so much to change baseball forever, in terms of the free agency clause. You have had some diverse openly gay baseball players who are from Oakland or Berkeley (Ed. Note:. That’s a reference to Glenn Burke, a Berkeley High School star who played Major League Baseball for the Oakland A’s and the Los Angeles Dodgers). You have watched Leon Powe, who was an Oakland Tech kid, go to the NBA and enjoy success. And many young women from Mack (McClymonds High) have gone on to other levels of women’s basketball. It’s been generation after generation of sports greats, and Oakland is proud of that tradition. Sports is part of our past. It’s also part of our future. Oakland is the heart of the East Bay. Becoming mayor and going to a lot more games and meeting fans like you who are so enthusiastic, you really realize that it’s a network that goes far out into the Central Valley, into Sacramento, up to all of Northern California, and they come to Oakland and Oakland becomes like their second home. And I think, more and more, that’s happening to the city, because of our great restaurants, our music festivals. A lot of former residents live on the edge of Oakland but they come home, literally, all the time for music and sports events. It’s a huge part of our economy. Oakland has been economically on the rise. That’s allowed me to hire more cops and to do more improvements in the city. A lot of that is because of the tourism to Oakland, and sports is a huge part of that. What really brought that home to me was the last game of the season last year for the A’s. Some of the naysayers have been saying that Oakland didn’t care, but we did our Sports Week (in October) without a lot of fanfare and so many of you guys showed up. Thousands of merchants put out the (Oakland sports) signs, similar to what we’re trying to do this week. But people were coming to the games. 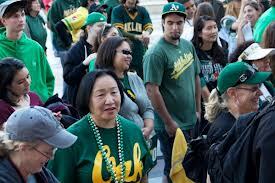 I read in the sports page that we increased the value of the A’s dramatically because of how much attendance went up. Really, I think anyone in baseball who watched what happened that last night (ALDS Game 5) had to have been impressed, where people just stayed for what felt like 15 to 20 minutes to me. They just stayed. The poor Detroit Tigers, nobody was even paying attention to them, nobody could hear what was happening. The fans stood and cheered until the A’s came back out. I think it was one of the most moving events in baseball last year. It totally proves how much Oakland, the East Bay and A’s fans care. So, there’s really no excuses not to stay. We have two prime sites that most teams would die for, and you’ve got the fan base here. All we need now is an ownership group that will step up and work with us on building a new stadium. restaurants/bars/cafes even after the economic collapse of 2008, and why does that success continue today? Mayor Quan: Yes, the restaurant and entertainment industry has gone very strongly because Oakland is a place where the arts are happening, and where new restaurants are happening. But the overall recession hit us pretty hard. Jobs and our property tax values went down. But what’s happening now is that everything is on the upswing. For instance, in terms of selling homes, for several weeks last year, Oakland was the fastest turnaround market in the country. That is, houses listed for sale were for sale for less than 14 days and owners were getting multiple offers. So, finally, the real estate sector got stronger, but we’re not quite caught up (to pre-recession levels). But what has taken off is the combination of the arts and the other entertainment venues, which includes sports. Obviously, it would be a lot more if we had a downtown baseball stadium, the impact on the local economy would go up even farther. The San Francisco Bay Guardian last year had a cover that asked, “Is Oakland cooler than San Francisco?” And they said, “yes,” and the reason why is because San Francisco has priced working-class families out of the city and has priced artists out of the city. Whereas Oakland is pretty much – in our government we’ve tried to have a balance of housing. We have housing for low-income, working-class, middle-class and high-end people. We actually like that diversity. It’s why so many artists and immigrants live in this city. So, it’s affordable for immigrants. We’ve become the most diverse city in the country. We and Long Beach are head-to-head to be the most diverse. We’re a city that speaks 120 languages. For the restaurateurs, many of them also have restaurants in San Francisco. What many of them say they like about Oakland is that, first of all, it costs them half as much to open a restaurant here than in San Francisco. Also, their workers live nearby instead of living in Oakland and having to go to San Francisco, and that there is a very sophisticated and very diverse audience for your restaurant. Some restaurants in San Francisco are high-end, but they are just for tourists. Whereas here in Oakland, they can appeal to an audience that likes more authentic food, so if you’re having a Cambodian or Lao or Mexican restaurant, it’s a much more authentic meal. It’s not made for a tourist from the Midwest who is staying in San Francisco for a convention. It’s made for people who may actually be from those countries and for people who are pretty sophisticated in their eating, who travel a lot. So, that combination makes, I think, Oakland’s restaurants some of the best, and cheaper than San Francisco’s. that most excite you about the city’s potential? Mayor Quan: I think this is Oakland’s time. We’ve been overlooked. And we have this amazing array of neighborhoods and open spaces. Let’s take the Coliseum for example … No one is ever going to build – at least not here on the West Coast, where land is so precious – stadiums that are just stadiums anymore. They’re going to be total destinations. And so, what was bad in the past is good for the future. We have a lot of acres out at the Coliseum, so we see there’s going to be housing, there’s going to be retail – though some people argue about what kind of retail and they’re worried they will compete with other areas for retail. But, I actually think there’s a lot of room for everyone to grow. I think, because the airport connector will be open there, there’s a lot of interest in maybe doing a hotel there. I’m hopeful that some of the new sports facilities can double for convention activities – not like the downtown convention center, but, you know, for the big shows, the really big concerts. Therefore, you can build a really great stadium without the public having to spend its dollars because the concerts and the other kind of convention-type activities will actually bring more business than the original sports. I was in Dallas and I looked at the Cowboys stadium and they were basically saying they make much more money off the non-Cowboys events, that it’s become a center for a lot of activities in Texas. Question: Oakland sports fans are a little frustrated at having to deal with the uncertainty of maybe or maybe not having a team to root for 5 or 10 years from now. What can you tell them to reassure Oakland residents and the city’s fans regarding what your office is doing to retain the sports teams? Mayor Quan: Well, you’ve already heard my metaphor. I feel like I came into the game as a pinch-hitter in the 9th inning. Maybe now, a baseball park at Howard Terminal will be much more beautiful than where Forest City is now (in Uptown), so maybe some things turned out right. Nobody predicted the Warriors were going to take off so early, I thought I had a little more time to work with them. That’s a hard site (that the Warriors are trying to build on in San Francisco), so I’m hopeful that they will come back. I feel like the Raiders want to stay and that we’ve been negotiating in good faith. They put some money into the exploration that we have to do to move forward. I feel like there is a lot of interest by foreign investors, in particular, in either stadium, the use of EB-5s, to help with the infrastructure of the stadiums. I think we have people interested in investing if we can just get people to agree on a location and a design. I can’t get people to invest unless they have a clear business plan and a clear schedule to pay them back. I’ve done everything I could – from even a few months before I became mayor — to try to catch us up. I think we’re relatively caught up. At least we will be by the end of this year. We’ll have two sites that are pretty well vetted for any kind of team – one at the Coliseum and one at Howard Terminal. So, I think we’re relatively caught up with anybody by the end of the year. When we’ve done our due diligence and our EIRs, we’ll see that the Coliseum is ready for development. It’s a question of what and who – whether we’ll have a one-team, two-team or three-team scenario there. And I think, by the end of the year, the fate of Howard Terminal will be very clear. And I’m confident that if baseball wants to be there, that we can make a deal for baseball to be at Howard Terminal. That would be great for downtown. That would be great for Jack London Square. There is huge business enthusiasm from companies that have stepped up for that scenario. I think things are looking good. It’s taken a while. Like a lot of things that you’re trying to change in a city, it takes a little bit to catch up and get prepared. But I think we are where we need to be right now.